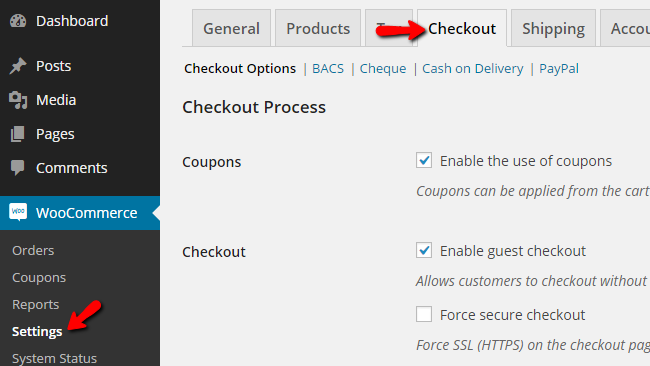 The checkout Options of WooCommerce will allow you to configure the use of coupons, to define the pages and URLs used by the concrete Checkout process components and most importantly a way to manage the existing payment methods. In the next few lines of this tutorial we will review all of the options related to the Checkout Process which you are provided with. Before you can start with the configuration of concrete payment method you will need to first configure the Checkout Options supported by your Store. This can be easily achieved if you access the admin area of your Wordpress application and then by navigating to the WooCommerce>Settings>Checkout page. There you will be able to find two section of settings and bellow we will discuss each one of those. The third and final section is called Checkout Endpoints and there you will be able to configure the URLs for handling specific actions during the checkout process. Keep in mind that these URLs should be unique and they should not be repeated. The final section is called Payment Gateways and there you will be able to receive more information on the already configured payment methods. And of course to set them as per your needs.